The digital age and the demand for social media, mobile apps and the Internet is increasing as time goes on. This type of media has become a part of our daily lives, meaning we wave goodbye to the days when static billboards and interruptive marketing satisfied us. The marketing strategy for each business is different, but with statistics showing that it can now take up to 20 impressions to actually reach a consumer, it’s important to invest time and money into dynamic marketing and advertising. A powerful way to make an impact on your consumer is through a digital signage solution. If you’re wondering how digital signage improves marketing, take a look at one of our blog post and infographic here. Creating eye-catching displays using a good digital signage software will grab the attention of your taget audience meaning they will take the time to read it. Initially investing in a solution may seem expensive, but over time you will see a valuable increase in your return on investment and also save on printing costs. You may not wish to use digital signage as your only advertising and marketing platform, but instead incorporate it with the strategy that you use now. 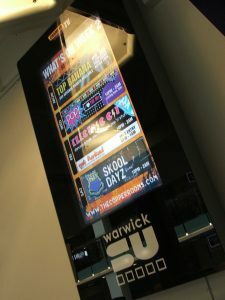 Using digital signage to complement your existing marketing platform can be extremely powerful. Offer information on your business, about what you do and even about your employees. Using this type of information gives your company a personal feel and will help to make a connection with your customers. Communicate your company brand. Make sure your display uses the same logo and colours as the rest of your marketing efforts in order to reflect the same brand. Digital signage is a great way to improve brand awareness and allow people to recognise your company simply from a logo or colour scheme. Investing in digital signage can be extremely exciting for any business, small or large. It opens a whole array of opportunities and gives you the chance to be creative with your marketing. Whether you want one screen or five, you may only need to purchase one software license for your particular network. Contact us today for more information or a friendly chat about a solution we can provide for you. If you have any more ideas you would like to share, please leave your thoughts in the comments box below. 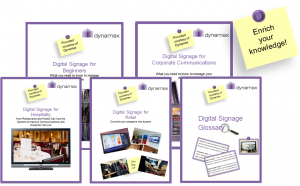 This entry was posted in Digital Signage, Tips and advice and tagged #avtweeps, #digitalsignage, #proav, digital signage, retail digital signage by Dynamax. Bookmark the permalink.